I got my mail today and how exciting for me when I discovered that the cards had arrived for the swap that I was in with some other demos. 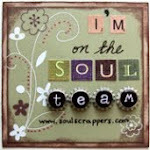 I love these swaps because I end up getting some really great cards and it gets my creative juices flowing!! Anyway, here are two cards that I received. The second card I also love. It just gives me thoughts of summer and since we just got a big dump of snow yesterday, thinking about summer is a good thing. This card was made by a demo named Lynne. The card stock is pacific point, kiwi kiss, summer sun. The combo is so great together. 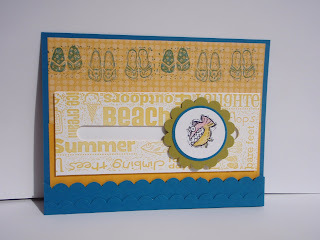 The stamp set used is from the mini catalogue called Just Beachy. The wheel called Lazy Days was also used. The card itself is a spinner card so the little fish will spin around when you move the card. 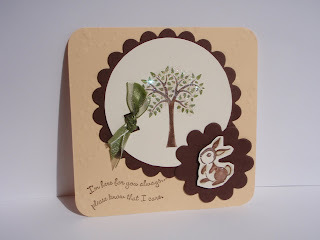 I'm off to do a little stamping of my own now. I hope you enjoyed seeing these cards.